As I mentioned earlier, the Book of Isaiah has a span of almost three centuries. Many biblical scholars and historians believe that the prophet, Isaiah of Jerusalem, ministered from ca. 738 until ca. 701 (or maybe until around 686 BCE). Although those were times of prosperity for the kingdoms of Israel and Judah, the divided kingdom enjoyed this ‘peace’ up until the Assyrian invasion in the region. In 733 Judah became a vassal of king Tiglath-Pileser III. The book accounts some confrontations between Assyria and Israel or Judah: the defeat of King Uzziah’s coalition (743-738, cf. ANET, 282), the Syro-Ephraimite conflict (735-732; cf. Isa 7), then the conflict between Assyria and Judah (714-705; cf. 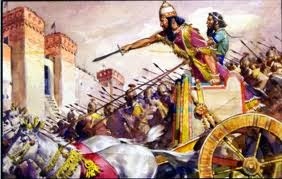 Isa 20:1-6; 18:1-19:15 and 14:28-32; ANET, 286), and Hezekiah’s rebellion against Senacherib (703-701, cf. Isa 22:9-11; 30:1-2; ANET 287-288). While living through this unsettled period, the prophet continued ministering to the Judean court. These historical events are then strongly related to Isaiah’s theological concerns. However, most scholars also agree that there is material in First Isaiah that reflects and therefore belongs to a later time (chs. 13-23, 24-27, 34-35). It would be very challenging to try and synthesize the message of Isaiah of Jerusalem in a few lines of a post, but here I provide at least some ideas on his two main theological messages: the social situation in Judah during his first years in ministry and the region’s political situation beginning around 734 BCE. Being contemporaries, Isaiah seems highly influenced by Amos in his social indictment of Judah (cf. Am 1:3-5 and Isa 17:1-3; Am 1: 9-10 and Isa 23; Am 4:1-3 and Isa 5;11-12, etc). This makes sense comparing the similarities both kingdoms shared in religious and social life at the time. Isaiah criticizes the dominant class for their luxurious life, their greediness, their oppression of their injustice to the less advantaged and their pride on their prosperity. Like Amos, (Isaiah shares also some of the prophetic formulaic expressions with him) Isaiah condemns that such behavior could agree with a life devoted to YHWH. Then in Isaiah’s political opinion we find the Davidic dynasty and the primacy of Jerusalem as the background of his messages. God’s promise of keeping an heir of David on the throne of Judah demands faith manifested in trusting YHWH, even in the middle of a siege. The Lord takes care of his people. That is why making alliances with other rulers is a betrayal to God’s providence. Some experts think that the purpose of Isaiah’s message is to justify God’s inevitable punishment of Judah. However, for others Isaiah looks for the conversion of his people. By denouncing their social injustice and their excesses, Isaiah wanted a change of heart, of behavior, for his people (1:17). For Isaiah of Jerusalem, conversion, reestablishment a good relationship between YHWH and his people is key for the survival of Judah. His people though were focused in living in pride and injustice, with no place for God, or remembering him with an empty worship at most. His experience of God made Isaiah become aware of his indignity, his conscience of unworthiness, of living among a people in need of conversion (6: 1-8). YHWH should be the most important thing for his people. And even if his people do not want to accept YHWH as the only ruler at the moment, they will accept him by force when the ‘day of the Lord’ arrives and human pride is subdued before God’s mercy. Isa 36-38 is almost identical to 2 Kings 18:13-20:19, another account of Senacherib’s attack and threat to Jerusalem.